Description Your comrades have been captured in the infamous Elephant Prison! Drop in your team of elephant commandos to crush the enemy infantry, pulverize tanks, artillery and helicopters, and demolish evil anti-elephant facilities. Your team starts off with a single ordinary elephant, but with your help can multiply and get suited with top-of-the-line military gear. You have five objectives to destroy before you can save your friends – do you have what it takes? 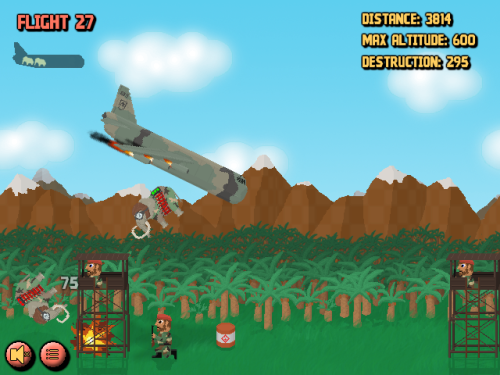 Launch the airplane and drop the elephant commandos onto the enemies below. Hit the barrels and TNT to help propel them forward. Each enemy you destroy grants you points and money to purchase upgrades. Upgrades include head gear, uniforms, brute force, mind control and much more. enemy forces with ease. Destroy all five objectives and free the captives from the Elephant Prison! Use the mouse to navigate, launch airplane and drop/explode elephants.